Listen Up, Fellow Weirdos! We’re Making Chocolate Avocado Cupcakes With Avocado Frosting! Now, now, don’t get all offended. I said fellow weirdos, didn’t I? The whole hernia thing has put me in a weird mood. Weird mood = weird food! 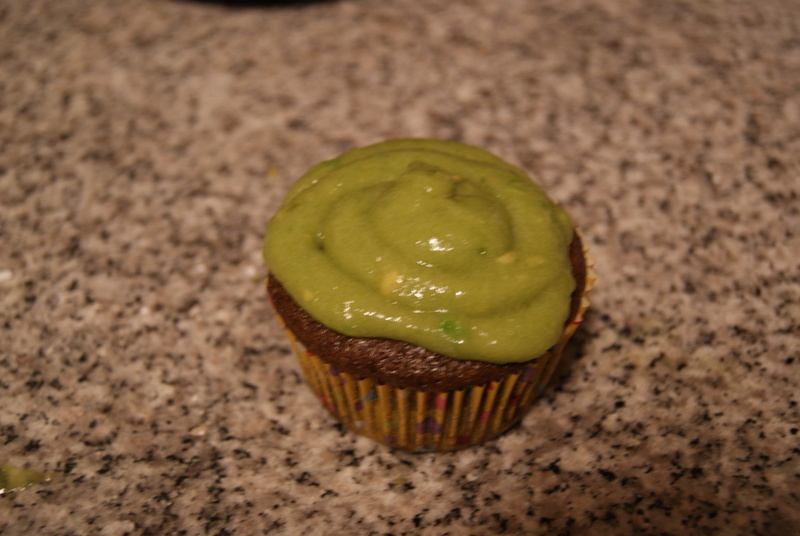 Anyway, a little over a year ago, when I was a poor, bored, unemployed graduate student with a sad and random pantry, I came across a recipe on Glamour.com (it doesn’t appear to be on the site anymore, otherwise I’d link to it) for Chocolate Avocado Cupcakes with Avocado “Buttercream” Frosting. Why the quotation marks? Well, the recipe also happens to be vegan. And, I happened to have everything I needed in my sad and random pantry! My life’s EXCITING! So, yes, it seems strange. 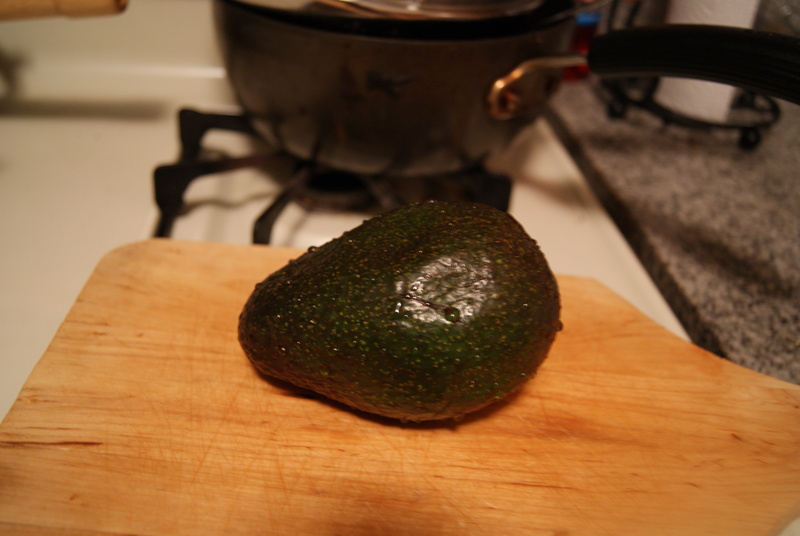 And avocados are not exactly cheap. Still, if you’ve got the time, the curiosity, and some eager taste-testers (or you’re just willing to eat like two dozen cupcakes all by your lonesome, no judgment), they are absolutely worth it. They’re moist, rich and perfectly chocolate-y. Vegan and non-vegan friends and family loved them. Also, since the only fat in these babies are oil and avocado meat, you’ll be doing yourself a favor by scarfing a few down. Let’s get our folic acid consumption on, homies! I know there are still some skeptics out there who aren’t fans of the fruit (It’s a fruit! 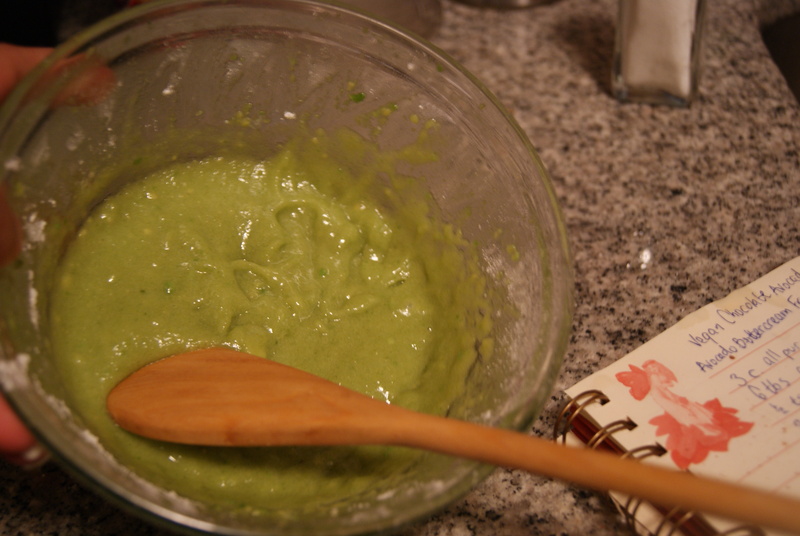 ), so let me say this: you don’t absolutely have to make the bright-green avocado icing. Since the avocados are used in the cupcake batter only as a binding agent in place of eggs and butter, and since the taste of avocados on their own is quite mild anyway, you won’t taste them at all in the finished cake. You will taste them in the frosting, though, and in my opinion, you should. Do it! Be weird! Get crazy! Preheat your oven to 365°F. In a large bowl, sift together the flour, cocoa powder, salt, baking soda and baking powder. 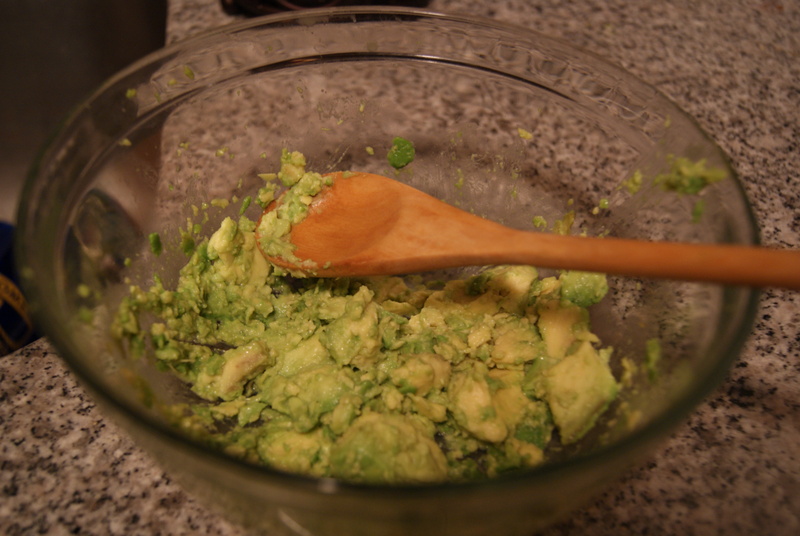 In a separate medium-sized bowl, mash the avocado with a fork or your hands if you’re super angry and powerful. Add to this wonderful gooey mixture your oil, water, vinegar and vanilla, then fold in the sugar until fully incorporated. Um…use a wooden spoon for this part. I used an electric hand mixer and now I’ve got a weird Kermit thing going on. Baking night is also now laundry night. 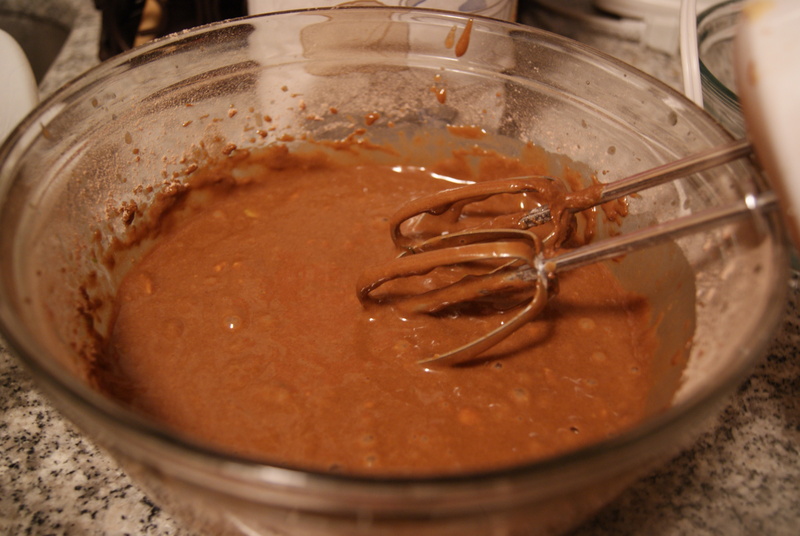 Add to dry mixture and whisk using a hand mixer or, again, get all up in there with that wooden spoon and start beating. The batter, or as I like to call it, "health yum yum soup"
Now, it’s almost impossible to get a totally smooth mixture without a stand mixer or magic or Jesus at your disposal. Don’t be frightened by the tiny specs of avocado in the chocolate mixture. Pour what you’ve got into your cupcake tin, filling each about 3/4 of the way. Pop them into the oven for about 15 minutes. While you wait, lick the bowl. No, really…lick the bowl! Since there are no eggs in this batter, it’s totally allowed. Tell your moms Shibow told you to lick the bowls, kids! Look how green! And yes, nerd keeps a recipe book. Your cupcakes should be just about done by now. Maybe they were done a little earlier, or maybe you forgot about them until your smoke alarm sounded and now you’re standing outside shivering in polar bear pajamas and hot firefighters are giving you the evil side-eye. This has never happened to me. Anyway, if you’re still inside and safe, and your cupcakes are cool, get frosting! In case you couldnt tell, I used a fancy icing decorator for this one. The other eleven werent as fortunate. What do you think? Too weird? Just weird enough?